The wait is over. The FA Cup first round is here and for the first time this season, the boys from League One and Two will go up against the minnows from non-league. BBC Sport takes a look at potential giant killings among the 40 ties as well as the stories behind those looking to create their own bit of FA Cup history. Didcot Town are the first round's lowest-ranked side. They lie 16th in Southern League Division One South West - the eighth tier of English football. In their first-ever appearance at this stage of the competition, the Railwaymen from south Oxfordshire face League Two Exeter City, a side four divisions above them. Joint managers Ian Concannon and Jamie Heapy will hope history repeats itself on Paul Tisdale's team, who lost 1-0 to Warrington Town at the same stage last season. Didcot's Loop Meadow Stadium is set to for a sellout crowd of about 2,800. Heapy, who made his club debut as a teenager in 1996, has gone on to make more than 860 appearances and is also set to start against Exeter on Sunday. "We've come from behind in four of the five rounds we've played already, so getting to the first round is a fantastic achievement," Concannon told BBC Sport. "The fact we're at home, against a league club and on television, it couldn't have worked out any better for the club." Can Didcot be this year's Warrington? Concannon sees no reason why not. "At the end of the day, it's a game of football," he added. "Anything could happen in 90 minutes and if we give a good account of ourselves, who knows?" Barry Hayles is one of football's great characters and on Sunday he will return to the ground where he spent just 474 days, but is still a cult hero. Hayles, 43, will be part of the Chesham United squad that faces Bristol Rovers at the Memorial Stadium - a place that holds some very special memories for the veteran striker. He scored 34 goals in 66 league games for the club between August 1997 and November 1998, before a £2m move to Fulham. It was a time when The Gas were managed by Ian Holloway, who Hayles reveals was not always conventional. "On occasions, he would pick names out of a hat and that was the starting line-up," Hayles told BBC Points West. "I thought it was meant to be tongue-in-cheek, but he knew the players going out there would give 100%." Hayles, who is now player-coach at Southern Premier Division side Chesham, admits it will be strange taking his place in the away dressing room. There will be nerves, but also excitement as he gets to hear the Memorial Stadium's roar one more time. "I'll have to do well to keep my emotions under wraps," he said. And what sort of reception is he expecting? "Hopefully a good one, I think I did myself justice when I played for the club." Highlights for Hayles include scoring on his debut and the last-minute goal against Brentford that clinched a place in the third-tier play-offs. "That's one of my greatest memories in football," he concluded. Harry Redknapp led Portsmouth all the way to FA Cup victory in 2008, beating Cardiff City in the final at Wembley. Two years later, Pompey were back under the Wembley arch against Chelsea - despite entering administration earlier that season and finishing bottom of the Premier League. Didier Drogba's second-half goal proved the difference that day, but Portsmouth fans were not to know it would be the start of a seven-game winless run in the competition. Last season, Pompey were unable to get the better of non-league Aldershot, who won a first-round replay 1-0 courtesy of Mark Molesley's winner after Jed Wallace had a goal wrongly disallowed for offside. Paul Cook's side, currently third in League Two, will hope a home tie against National League side Macclesfield will end their cup drought. At the age of 39, having played for 14 different English league clubs, made 20 different transfer moves and even spent two years playing for a team in Kazakhstan, you might have thought Jamaica international striker Deon Burton had seen it all in his long career. But the man who played in two quarter-finals in three seasons - first for Portsmouth, then with Derby County - had never previously featured in the qualifying rounds of the FA Cup until joining Worcester City in September. Without suspended fellow 39-year-old veteran Lee Hughes at his side, the much-travelled former Sheffield Wednesday striker is set to play against Sheffield United for Worcester at Bramall Lane. Burton has scored in every round so far, including both goals in City's 2-1 fourth qualifying round win at Gateshead. The men in blue and white stripes are looking to match the "pandemonium" of last season's exploits - beating 1987 winners Coventry City at the Ricoh Arena before bowing out to Scunthorpe after the longest penalty shootout in FA Cup history. "I've not played in the qualifying rounds before," Burton told BBC Hereford & Worcester. "It's a new experience for me and a bit different. The incentive for me is to play sides I've played against before. "But you never know. We played excellently at Gateshead. "Since I've been here, we've only lost three times in nine games. With Nathan Vaughan in goal, you know he's going to pull off world-class saves like the one in the last minute." Deon Burton had scored five goals in 29 FA Cup ties with nine different clubs before this season. If he scores on Saturday, he will have doubled his cup goal tally to 10 - in the space of just four ties for Worcester City. Sheffield United, eighth in League One, are 84 places higher up the football pyramid than Worcester, who lie 20th in National League North. Where and who are Barwell? Didcot Town may be the lowest-ranked side in the first round, but the title of smallest location goes to Barwell of the Northern Premier League. The Leicestershire side, who are nicknamed the Canaries and wear the same colours as Norwich City, face National League club Welling at their Kirkby Road ground. A large village with a population around 8,750 in the Hinckley and Bosworth district, Barwell is situated between Leicester and Coventry and just a few miles from the M1, M6 and M69. This will be Barwell's first appearance in the first round. Chairman Dave Laing has been involved with the club for 38 years since the age of 18. "Everyone is buzzing," he told BBC Sport. "Naturally, we're the underdogs facing a National League side, but we've watched them and we know on our day we can beat sides at a higher level. We've done it before. "The team is a mix of butchers, bakers and candlestick makers. We have heating engineers, electricians, window cleaners, carers - all sorts. "We're all really looking forward to it." Nicky Forster is no stranger to the FA Cup having scored goals for six different clubs in the competition. The 42-year-old found the net for Gillingham, Brentford, Reading, Hull and Brighton. The sixth club might not be too familiar to many, but Forster netted a brace on his debut for Sussex County League side Lingfield in a qualifying-round tie against Hailsham Town in 2011. Forster is looking to create a bit of managerial history for himself in a competition in which he never went beyond the fifth round as a player, despite his good record in front of goal. Forster takes his Isthmian League Staines Town side to League Two Leyton Orient on Saturday, a side three divisions above them. "It's a big day out for the club," he told BBC Sport. "To get to this stage, we've had to show a level of consistency in the previous rounds, beating sides leagues above us in some cases. "This is one for the players and the fans to enjoy really. We're obviously the big underdogs. "But when I was playing for league clubs and we were drawn against non-league sides, I remember it was never as easy and not as comfortable as you'd have liked. "So, hopefully we can cause an upset." Forster will be able to call on the experience of players such as former Birmingham centre-back Darren Purse as he looks to reach the second round. Additional reporting by Ged Scott, Nabil Hassan and Owen Phillips. On Saturday, Football Focus will be live from 12:10 GMT at Wealdstone ahead of their tie against Colchester United. 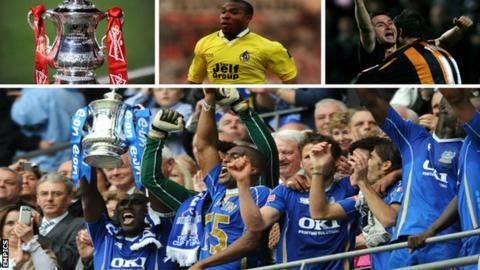 FA Cup Final Score will show all the key action as it happens from eight selected matches on Sunday. Every goal from every match will be available on the BBC Sport website and app as part of the BBC's extensive digital coverage, providing fans with action as early as 17:15 GMT on Saturday. There will also be a comprehensive 90-minute highlights show on BBC Two on Sunday at 18:30 GMT. BBC local radio will also provide full-match commentary across the weekend's ties through the BBC Sport website. How does your club hit the FA Cup jackpot? Read more on How does your club hit the FA Cup jackpot?